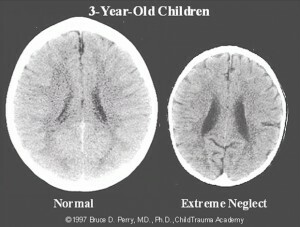 Research shows that chronic neglect and abuse represent a profound threat to a child’s brain development. Their brains are smaller and their fuses are shorter, emotional wiring doesn’t connect properly. It is biologically necessary to turn to caregivers for food, comfort and other basic needs. When these needs aren’t met, the lack of care sets off a biological stress response. Even before birth a flood of hormones can damage key areas of the brain. The brain is wired to be in a stress response before they even take their first breath. Dr. Charles Nelson, a Boston Children’s Hospital neuroscientist, studies how children’s early experiences shape the developing brain. Abuse and neglect, he says, can cause significant damage to the circuitry of the brain. Nelson had the opportunity to study a population of children: Romanian orphans raised in harrowing conditions in state orphanages.This gave Nelson a unique opportunity to study the effects of profound deprivation on brain development. Using neuroimaging tools, he compared the brains of the children brought up in the orphanages to those of children raised outside. Research on abused and neglected children has indicated the devastating effects of maltreatment on the child’s growing brain: smaller brain size, decreased growth of the corpus callosum (connects the right and left sides of the brain) and impaired growth of inhibitory neurotransmitters, including GABA, that serve to calm the excitable emotional limbic structures; through brain imaging studies and neurotransmitter testing. Even after children are introduced into safe and loving homes, the disrupted neurochemistry is still present. Sympathetic and parasympathetic are terms we often hear but may not completely understand. They are parallel systems that operate in the human body. The sympathetic nervous system is responsible for the excitatory messages; and the parasympathetic nervous system is the regulator of the inhibitory neurotransmitters- the “breaks pedals” to our systems when they are in overdrive. The sympathetic division is the accelerator and when turned on at an early age, winds up being the primary driving force for behavior. The sympathetic division typically functions in actions requiring quick responses: anxiety-driven behaviors, impulsivity, aggression, anger, meltdowns, even trouble controlling body sensations. Without the breaks, these challenges actually rewire the brain. Inhibitory neurotransmitters are developed in infancy and over time, especially through touch and having ones needs met: a baby cries to be fed, he is held and receives the milk he needs. However, neglect, abuse, malnourishment, prenatal stress, or early attachment/trauma, can send mixed messages to the brain and therefore it is unable develop an optimal amount of these inhibitory neurotransmitters. This often leads to the inability for one to control their responses from excitatory neurotransmitters, and contributes to children living in a state of fear and/or hyper-vigilance- also known as the flight or flight response. Neurotransmitter levels are a blueprint for a child’s mood, behavior, and overall functioning. We can test for these levels with extreme accuracy. this helps parents understand their child brain chemistry and allows them to treat the imbalances. Continual research has shown that our early years create our brain’s destiny. As relationships with parents changes, so do the children’s attachment. This means it is never too late to create a positive change in a child’s life. Through regulating neurotransmitter levels, the ability to create a healthy bond with parents becomes much more feasible.